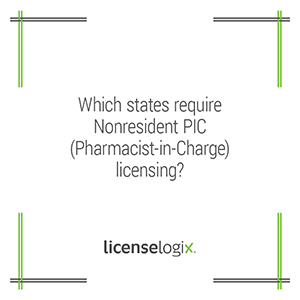 Which states require a nonresident pharmacy’s Pharmacist-in-Charge (“PIC”) to be licensed through that state’s Board of Pharmacy? Currently, the following states require a nonresident pharmacy PIC to be licensed in their state: Alabama, Arkansas, Kentucky, Louisiana, Maryland, Michigan, Mississippi, Nebraska, Oklahoma, Oregon, Tennessee, Virginia and West Virginia. As of September 1, 2016, Texas will join the aforementioned states in requiring a Texas licensed PIC for a nonresident pharmacy.